Victor Kiktenko aka Module One’s EP for Anna Wall’s imprint The Bricks is inspired by the disciplines of Detroit. A sound shaped by luminaries like Mike Huckaby, Rick Wade and Kyle Hall, Victor has spent the last nine years refining his own unique approach to this style of house music. Residing in the industrial city of Novocherkassk in the South of Russia, it wasn’t until the summer of 2018 that he relocated to Berlin – and it was a liberating decision. “With the growing power of the Police structures, the parties and festivals were often shut down the last minute which gave absolutely no way to plan our careers and I remember having up to 4 jobs at the same time to survive. Russia is a pretty poor country…the majority of people working extra hard and having several jobs. Berlin wasn't only an inspiration, but also a very logical and pragmatic move.” ‘The One I Believe’ was made during his time at home as he awaited the German visa process. 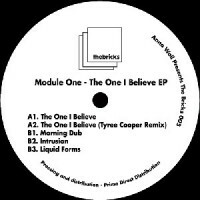 The four track EP displays the various forms of Module One’s production; from the dub-techno sounds of ‘Morning Dub’ to playful electro kicks on ‘Liquid Forms’. Chicago’s Tyree Cooper has given ‘The One I Believe’ a classic rework adding his trademark drum machines and a subtle 303 acid line that compliments the original.